Do you want your pupils' parents to find out more about how to help your primary age children with their science? This project helps Mums and Dads to find out about the science their children are doing at Primary School. Focussing on Key Stages 1 and 2, I take parents through the stages of understanding and vocabulary that children go through as they progress through the science curriculum. More than that, though. I offer ideas for families to try together that will help children 'get their heads round' some of the complex ideas they have to learn in Science. The visits are free to schools. So if Mums and Dads want to help kids with their homework, this is the ideal way to get up to speed with what the National Curriculum asks for. The meetings are informal and take place in the school, usually during school time, and we sit around drinking tea and coffee and indulging in Hobnobs. The project was initially funded by Engineering and Physical Science Research Council. 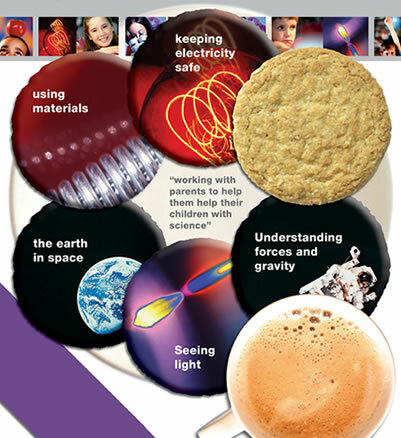 Science with Coffee and Hobnobs is now run by the University of Southampton. A 2 hour event for primary schools. Combine a hands-on activity or a whole school science show with a presentation to parents explaining how science works in your school. Now available in Southampton area thanks to sponsorship by University of Southampton.